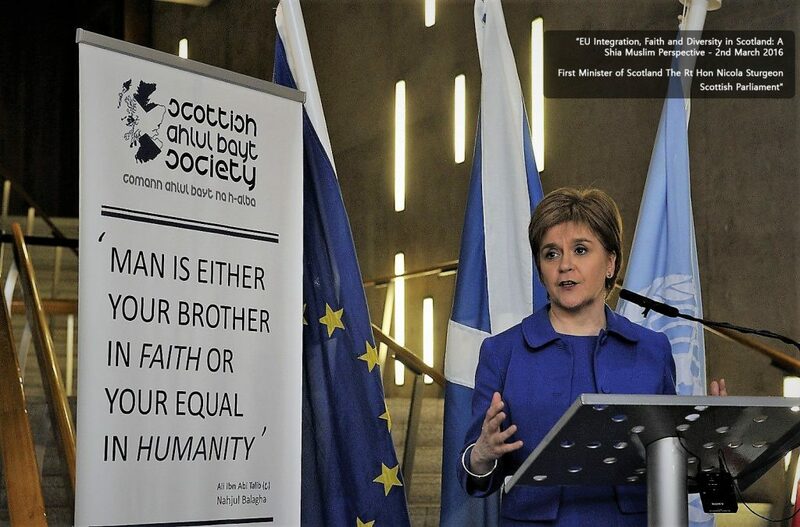 The Scottish Ahlul Bayt Society is a faith-based (Shī’a Ithnā ʿAsharī ) organisation working to meet the needs of the Scottish Shia Muslim community and the breadth of society in general across the cultural, social, political, and religious spectra. We work to engage with other communities and faiths; strengthening ties in an effort to create a setting for religious and racial harmony, equality, and diversity in the nation. We interface with civil society and the third sector, academic institutions, diplomatic and governmental bodies, religious leaders, and exert efforts towards grassroots, communal faith and interfaith activities, philanthropic drives and campaigns in our partnerships with national and international healthcare charities and trusts to better the nation’s physical and mental well being – highlighting the messages of humanity and good will. Man is either your Brother in Faith, or your Equal in Humanity. We are committed to educational workshops, seminars, gatherings and classes to address the needs and interests of the public in general, and the adherent of the Shia faith in particular, to enable people to attain an authentic and sophisticated understanding of the teachings of Shia Islam, as an ideology that can contribute to broader humanitarian discourse and spiritual development. We work to socially include and integrate those amongst the youth, the women and the elderly. We look to provide support, humanitarian and charitable aid nationally and beyond, practical assistance, counselling to the community, and relief to those in need by reason of age, ill-health, disability, or other disadvantage. We seek to foster dialogue, and interfaith and intrafaith engagement in the hopes to work towards a platform of mutual understanding, coexistence, trust and collaboration upon which our actions may be directed towards the betterment of the nation and beyond. The Scottish Ahlul Bayt Society operates under the organisation’s five branches: The Edinburgh Ahlul Bayt Society, SABS Education, Lady Sughra School, SABS Theological Forum and the SABS Healthcare Awareness Campaign. (a) To organise a committed project to establish links and build bridges between the Scottish Shī’a Ithnā ʿAsharī Muslim Community and society at large, to enlighten others about the teachings of Islam. (b) To bilaterally engage with institutions, charities, bodies and organisations from across the spheres of healthcare, education, politics, faith, and civic society on a humanitarian basis, so as to advance the contribution of the Shia community underpinned by the Islamic values of virtue, justice, compassion, social responsibility, and social action. (c) To provide a place of gathering for lectures, seminars and public meetings for the following purposes: faith-based, cultural and educational dialogue, the propagation of knowledge, to promote civic harmony, to promote healthcare work and the work of charities, and to promote equality and diversity. Emphasis is to be placed on these being delivered in the English language, so as to keep the programs accessible to the general public, the Scottish Muslim community and the youth of the established Muslim community. (d) To provide support, practical assistance, counselling and education for the Scottish community of people who have converted to the religion of Islam, and the community of ‘raised’ Muslim men, women, youth and children. (e) To provide support and practical assistance relief for the immigrant, refugee and converted individuals and families, either living in or coming to live in the major cities of Scotland and to aid their integration into society. Also, we aim to provide relief, through social projects, to those in need by reason of age, ill-health, disability, hardship or other disadvantage.